So I actually read Samantha Young's debut contemporary romance On Dublin Street quite awhile ago. And then I just never reviewed it. It may have simply gotten lost in the shuffle or I got distracted by some shiny object or what have you. The thing is, I enjoyed it fine. It lingered around the edges of my consciousness enough that I was looking forward to the sequel and immediately purchased a copy upon its release earlier this month. Down London Road takes place not long after the events of On Dublin Street and focuses on Joss' friend and co-worker Johanna. I wasn't sure what to expect going in, given that Johanna was not the most sympathetic of characters in the first book. But I'm coming to learn that those somewhat acerbic, occasionally deceptively simple side characters often come into their own with a vengeance when it's their turn in the spotlight. And I so love it when that happens. I was also awfully eager to return to the setting itself. I didn't get to spend as long as I'd have liked when I was in Edinburgh and I've longed to go back ever since. Happily, reading these books sent me straight back to wandering those same streets, ducking in and out of cafés, and generally soaking it all up. Jo Walker has perfected the art of keeping all her balls in the air. From a young age, she's been the responsible one in her family (and I use the term "family" very loosely). Having bid good riddance to her deadbeat dad, Jo supports her alcoholic mum, her teenage brother Cole, and herself secretarying by day, bartending by night, and professionally girlfriending both day and night. Ever since the day she realized she could attract rich older men, she's taken that role seriously. And she's never been without a sugar daddy for long. The lives of three people depend upon it, in fact. And so while she never stays in a dead end relationship and she always chooses her partners with the utmost care, she's also never really been in love. Money always trumps emotions when it comes to keeping food on the table, taking care of Cole, and ensuring that the blackness that touched her own life growing up never stretches out to mar his. And she's learned to be all right with it. Really, she has. But when she attends an art exhibition on the arm of her current boyfriend Malcolm and makes the acquaintance of one Cameron MacCabe, the sparks (both good and bad) that fly threaten to throw off her delicate juggling act. And when she winds up helping Cam out by putting in a good word for him at the bar where she works, Jo unwittingly sets in motion a series of events sure to get in the way of the safe, structured course she has all mapped out. When you first tore me a new one, I wanted to know you. And when I got to know you, when I stood across a kitchen and you told me not to kill a spider because it didn't say much for us as a species if we killed something because we feared it, I knew. I'm not saying who says it and I'm not saying who they say it to. All I am saying is--it's a good scene. This entire book is made up of good scenes, complex and nuanced characters, and one supremely encompassing romance. Down London Road is the kind of contemporary romance you can sink your teeth into. I had an alarmingly good time reading it, and I will unquestioningly be back for more. The Allure of Books - "I was beyond invested in this story." Book Binge - "This book is as much Jo's personal journey as it is a romance." 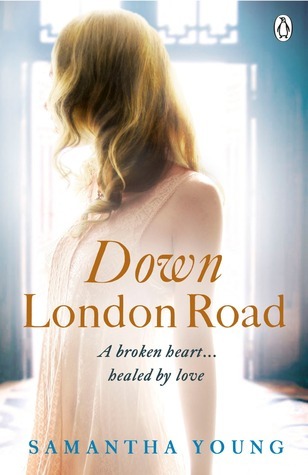 The Bookpushers - "I really think Samantha Young hit the ball out of the park with Down London Road." Dear Author - "This is not a heart and flowers, easy reading romance. The characters are tough to like at times, but their motivations always read purely to me." Fiction Vixen - "One thing I’ve come to love about Samantha Young’s characters is that they always project an undaunted realism." Smexy Books - "I absolutely positively adored Jo." that WAS a good scene :) I also loved loved loved the way he looked at her during the original "don't kill the spider!" scene. And the original scene--so good as well. I just loved the whole thing so much more than I was expecting. I don't think you could steer anybody wrong. Every review gives me hope and makes me believe in what you're writing about, good or bad. Perhaps that's why I picked up Nowhere But Home from my library and now this one is certainly next. That is the kindest of compliments, Ash. Thank you so much. Let me know how you like Nowhere But Home!! Yeah, I clicked with her like nobody's business. It sounds to me like readers are really loving one or the other, Joss in the first book or Jo here (though they're enjoying both books a lot). I liked Joss, but I *loved* Jo. So much. Good thing I was already planning on visiting a bookstore this afternoon; I hardly think I could wait much longer to pick this one up after that review. Please tell me what you think when you've read it. I'd love to hear. Yay, another bibliocrack review! You know I love bibliocrack recommendations from you (I still need to review Big Boy). The trophy girlfriend situation is kind of similar to Unsticky, isn't it? Do I need to read On Dublin Street before this one? Please review BIG BOY. I would love to hear your thoughts. It is similar to UNSTICKY now that you mention it, though it didn't occur to me before. Jo is running from some darker things, and Cam is sort of the opposite of Vaughn in the wealthy, debonair department. But yeah. Some similarities there. You definitely do not need to read ON DUBLIN STREET first. I'd just go ahead and plunge in with this one. It's lovely. I really should review Big Boy. I've read ALL of her novels and I haven't reviewed any of them. I'm so behind on reviews. I thought of Unsticky after reading your review because of the whole sugar daddy thing, although you're right, Cam isn't like that. Thanks for the heads up. Will probably read this one first and I'll try On Dublin Street if I enjoy reading this. Oooo now I really want to read it. But I haven't read On Dublin Street. Its it ok to read them out of order do you think? Totally okay, Amy. No need to read On Dublin Street first. Okay, Chachic already asked my question. I shall plunge ahead! Ooh, I hope you like it, Maggie. No worries, though, if you don't, of course. But I'm ever so curious if Jo is just a crazy-accurate Angie-type character or if others will have her back, too.